Baltimore, MD – March 20, 2017. Nancy and Randall Faber, leading music educators, co‐authors and publishers of Faber Piano Adventures, are pleased to announce the appointment of Fred Karpoff as Director of Professional Development at the Faber Piano Institute. The appointment represents a new artistic partnership in support of the Fabers’ “Year of Technique and Artistry,” — a year that includes the release of new publications, demonstration videos and live events focused on effectively teaching modern piano technique to students of all levels. Winner of the MTNA Frances Clark Keyboard Pedagogy Award and Steinway Artist, Fred Karpoff, has performed as soloist and collaborative pianist on four continents. He presents workshops and master classes throughout North America, and is artistic producer of Entrada Piano Technique, an online video resource for teachers and students. He is Professor of Piano at Syracuse University and has served as Visiting Professor at the Eastman School of Music. A hallmark of the partnership is a new video series entitled “Sight Sound Story” to be released in 2017. Teachers and students can hear outstanding performances of Randall Faber demonstrating pieces from The Developing Artist Piano Literature series, observe master coaching of select repertoire with Fred Karpoff, and listen to essential commentary for greater understanding. Additionally, Faber and Karpoff will co‐present on the evolution of piano technique at the 2017 National Conference on Keyboard Pedagogy, July 26–29, 2017 in Lombard, IL. Dr. Karpoff will also become a senior clinician with Faber Piano Adventures. 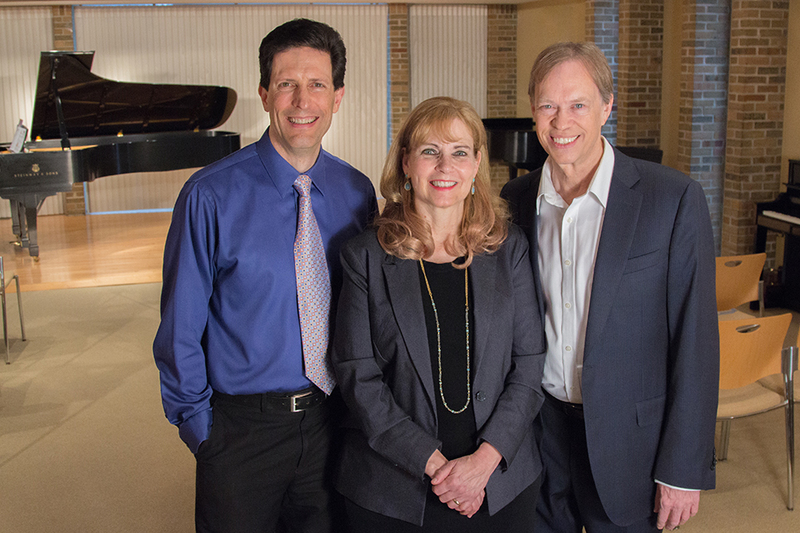 Nancy and Randall Faber have combined their backgrounds as composer and performer to become leading supporters of piano teachers and students. The husband and wife team has authored over 300 publications, including the bestselling Piano Adventures method and the PreTime® to BigTime® Piano Supplementary Library. Their innovative and exciting methods continue to enjoy an unprecedented response from teachers and students around the world, setting new standards for quality educational publications in print, audio and digital formats. Piano Adventures has been translated into seven languages and is distributed exclusively by the Hal Leonard Corporation. Visit pianoadventures.com for more information.